Seriously? OMG! WTF?Guinness World Records Archives - Seriously? OMG! WTF? Hugh Jackman and Sir Patrick Stewart broke the same World Record! 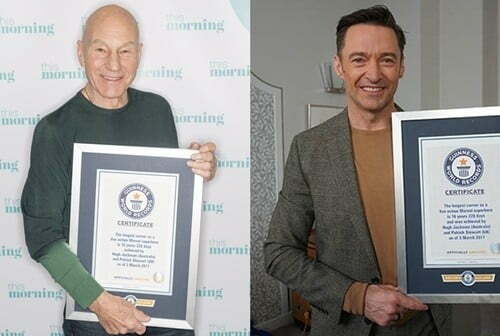 Hugh Jackman and Sir Patrick Stewart are in the Guniess Book of World Records now and they are listed for the same thing. Are they in it for breaking the longest time tied to someone without breaking loose? Nope, but I like that. They both have the longest career as a live-action Marvel superhero. How long have they been playing Wolverine and Professor X? They have been doing it for 16 years 228 days. Both actors started playing their characters in X-Men and ended it with Logan. You know Jackman can end the tie if he would just agree to Deadpool vs Wolverine. Is it tempting him yet? I don’t think so because he has set his sites on breaking the longest marathon playing badminton, singles, record. He only has to do that for 25 hours, I think that is possible for Stewart! Most people buy pine trees to celebrate Christmas, while others go with a plastic one. For example, the town of Gobierno del Estado de Aguascalientes in Mexico has the largest plastic bottle sculpture. According to Guinness Book of World Records that festive tree is made of 98,000 plastic bottles and weighs a whopping 22 tons. I don’t think it will be going anywhere anytime soon. Which is a good thing because it is for an environmental care campaign that 70 local schools assisted in making. What a way to make a powerful statement you cannot ignore. You are never too old to enjoy cake on your birthday, even on your 118th one!!! Julia Flores Colque turned the big 1-1-8 on the 26th, making her the oldest living person in the world. That is if Guniess Book of World Records accepts her 1900 birt into their book. Which I am sure they will, now that they know about her. Whether they do or not, she still has reason to celebrate. She is 118 years old. You would think after blowing out the candles that many times, she would get bored of doing it. But she still has wishes to make. Plus, who does not love eating their own birthday cake? She loved every bite. She also loves playing the flute. When she is not doing that she is playing the guitar and singing a song for her cats, dogs and anyone who will listen including her 65-year-old grandniece, whom she lives with according to ABC News. If I live to be that old, I hope to enjoy life as much as she does! Watch a 106-year-old man ride a zipwire! You know the expression, you are as old as you feel? When it comes to Jack Reynolds, he feels much much younger than his years. For his 104th birthday, he became the oldest man to get his first tattoo. He followed that Guinness World Record up with becoming the oldest man, at 105, to ride a roller coaster. In April, when he turned 106, he did it again by being the oldest person to ride a zipwire. A camera caught him enjoying his ride. Even though he is 106 years old, his joyful face looked 100 years younger. Proving, you are never too old to be a kid at heart. His joy brought me so much joy. It is hard not to smile as huge as he is smiling. I cannot wait to see what he does to top this all for his big 1-0-7! While this is an old record, it is resurfacing now because the 2019 Guinness Book of World Records came out last week. To see him being interview by Good Morning Britain, then click here! This couple has been married for 80 years and counting! On July 25th, when they got the title, Masao was 108 years and 16 days old while his wife Miyako was an even 100 and 243 days old. The Japanese couple was married in 1937 and they have 5 daughters, 13 grandchildren and 24 great-grandchildren with one more due later this month. Even though they have been married for over 80 years, they still look very much in love. Who doesn’t want to have a love like theirs? I know I dream of it every night and still nothing.